Victor Chandler, the group behind VC Casino has over 60 years of experience in this field and although the VC Casino site is a major aspect of their empire, it sits neatly alongside betting, Poker, Mobile betting, gaming and even live Casino options on the site. This wide range ensures customers can have a lot of choice from just one site and that the company has a strong reputation to draw on in offering support to consumers. VC Casino offers Play for Fun options on the games on offer which allows users the opportunity to try out certain games and get used to the system and layout of the site. VC Casino has a very clear site that is easy to sue with the graphics being cartoon in style but never childlike. 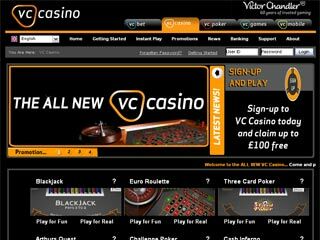 With less than 50 games on offer at the VC Casino section, the site has less variety than many rival sites but with access to the full range of VC sites available from the same page, there is no reason to complain about a lack of games. All the standard favourites are available in addition to many slots, video games and more quirky games like Lotto based efforts or Hi-Lo games. VC Casino offer a free 24/7 helpline as well as an email facility so there is always the opportunity for customers to contact the site with any problems they may be experiencing. The FAQ section of the site is slightly sparse but it gets straight to the point and will answer any overview questions that may arise for a newcomer on the site. Newcomers to VC Casino need to deposit funds and then play games to a value of £2,500 and they will receive £100 for free. This is slightly harder work than some of the welcome bonuses on offer by some sites but the reward is larger so it depends on how regularly you expect to be visiting the site whether this will be a worthwhile incentive for you. One of the current bonuses available in VC Casinos is available in October on a Sunday and Thursday night where if you take on Victor at Euro Roulette or Blackjack and win, you will receive a 10% bonus on all your winnings. Another bonus is a monthly cash prize being split between members and the more times you visit the site, deposit fund and play games, the higher the chance of ending up with a share of the spoils. A total of £250,000 will be given away each month so there is a lot of money on offer which again, encourages players to keep coming back regularly. The VC site may lack a lot of the major promotions or depth of games but they offer large incentives to encourage people to come back and play on a regular basis. If you are planning on using a site frequently, what VC Casino offer in the way of incentives may be just what you are looking for.